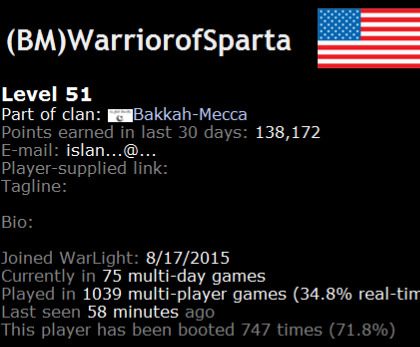 Bakkah-Mecca is accepting non-troll players with a boot rate of 35% or lower! Oh noes I'm 0.8 too high!!! over 100% is too high. It is. I refuse to let it die. you used to be in it not that long ago. I don't even see that guy on my invite list. I take it they are a troll or something? I'd rather join DARKLORDS or the KKK (in rl) than join Bakkah-Mecca. Everyone over 2% is not reliable. If you guys become more active, I might put an alt in you. Nah, I may have gotten the clan for free from somebody and just never bothered to develop it.